American blogger Joe McPherson started his site ZenKimchi a decade ago to keep relatives in the United States up to date on his life in Korea. He had no inkling of the ride it would take him on. The popular site (zenkimchi.com) recently celebrated its 10th anniversary, confirming its status as a mainstay of Korea’s rapidly evolving culinary scene. In step with the cuisine’s growing popularity abroad, the blog has evolved into a public relations firm, ZenKimchi International. He’s appeared in the New York Times, Wall Street Journal and CNN, and rubbed elbows with famous foodies such as French chef and television personality Eric Ripert. “I’m living the dream,” said McPherson, 39, reflecting on the 10-year milestone. 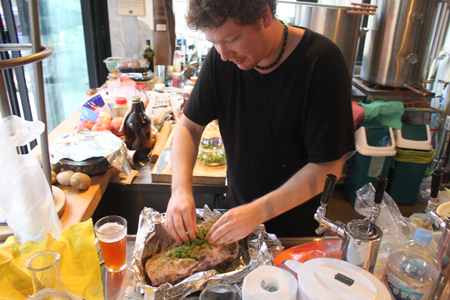 “I’ve figured out a way to combine my love of food, writing, technology and history. Originally from Alabama, McPherson was working as a television and radio producer before traveling here — a move partially inspired by the work of globe-trotting foodie Anthony Bourdain. His first blog entries were about life as “a fresh-off-the-plane newbie.” He soon took interest in food blogs, but noticed a dearth of sites about Korean cuisine. He began using ZenKimchi as a place to keep track of recipes, food “discoveries” and restaurants. He caught a break in 2007 when the New York Times contacted him for a story on Korean fried chicken. And, “the blog went through the roof in traffic,” he said. A pivotal year for Korean cuisine came in 2008, with developments such as the viral popularity of L.A.-based food truck company Kogi Korean BBQ, which fused Korean and Mexican food. Today, in addition to consulting, the company offers walking tours such as the “BBQ tour” and the “Dark Side of Seoul” tour, which tells of the city’s macabre past. On Feb. 19, McPherson will be involved in Seoul’s first annual Mardi Gras ball at the Southside Parlor in Itaewon. Organized by networking group LinkedSeoul, which is co-run by ZenKimchi, the event will feature classic dishes such as chicken and sausage gumbo and po’ boy sliders. We spoke with McPherson about the rise of ZenKimchi and the Korean food scene. Q: What have been some of the biggest changes in the Seoul food scene during the 10 years of ZenKimchi? A: It’s gotten seriously diversified. Not only restaurants, but grocery stores carry a much larger variety of products than 10 years ago. The old conventional wisdom was that Korea was a culinary monoculture. There was only Korean food. Even vegetables like celery were difficult to find. Korean food itself seemed to have little variety — most all the “banchan” (side dishes) was red, using the same flavors. Then diversity…happened in trends. When I first came here, frozen yogurt was popular. Coffee shops grew. The roti bun became a trend. Then the “Hamburger Renaissance,” followed by the “Pizza Renaissance.” Then Indian and Mexican food exploded on the scene. And then the beer! Q: How do you describe eating in Korea to people who aren’t familiar? A: If I was forced to summarize Korean food into two aspects, they would be fermentation and community. Fermentation applies not only to kimchi and doenjang (bean paste) but also to spirits, makgeolli (rice wine), fruit extracts, shikhye (rice drink). Most every dish in Korea depends on fermentation in one way or another. 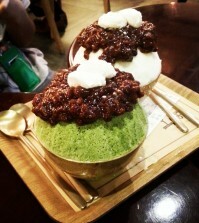 I say community because eating in Korea is a communal experience. People share the same soups, the same grill, the same side dishes. Meals are seen primarily as social gatherings and they revolve around sharing. 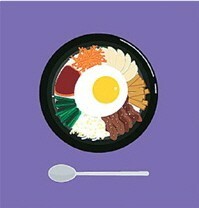 Q: With the popularity of Korean food growing, has it taken a permanent foothold abroad? 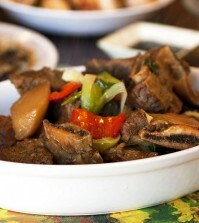 What do you think of government efforts to promote the cuisine? A: It’s easy to become a trend. The hard part is staying there. In the U.S., Thai food became the big trend over a decade ago. But it didn’t spread much beyond restaurants because people didn’t make Thai dishes much at home. Korean food is starting to position itself a little better. Home cooks are starting to experiment with Korean dishes, and they’re finding how easily Korean food can become part of their daily lifestyles. I’ve been a bit critical about government and corporate efforts up until late. Their problems tended to be that they didn’t know or care to know their audience. They relied less on market research and more on stereotypes of foreigners to direct their campaigns. They also marketed to foreigners the same they they’d market to Koreans, which means an unhealthy reliance on celebrity endorsements, which is known as the laziest and least effective form of advertising. Q: What are the most interesting trends you’re seeing now? A: Unfortunately, the trends I’ve seen in Korean restaurants have relied heavily on gimmicks. The current gimmick is the camping-themed restaurant. I haven’t eaten in one yet that tastes any good. That said, I think casual fine dining is starting to pick up where white tablecloth fine dining has failed in Korean cuisine. They’re making Korean food more sophisticated without being pretentious. We’re also seeing a move to more artisanal and organic foods. 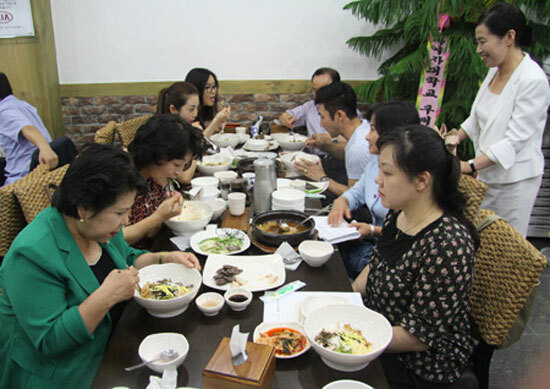 The relaxing of makgeolli brewing laws created an explosion of top-notch makgeolli around the country. People are starting to rediscover and respect the rural peasant roots of Korean cuisine. Q: You got chance to hang out with Eric Ripert when he visited in October. What was that like? A: I’m a big fan of his and his drinking buddy Anthony Bourdain. My biggest impression was how down to earth he was. He’s insanely curious and his mind is always working, trying to figure out an ingredient he’s eating or how another ingredient can be used in a dish. I can’t believe he got me to eat a piece of boiled lung on a dare. A: I’m an adventurous eater, but that was a tough one to swallow. Ripert smiled at me mischievously, as if he tricked me.